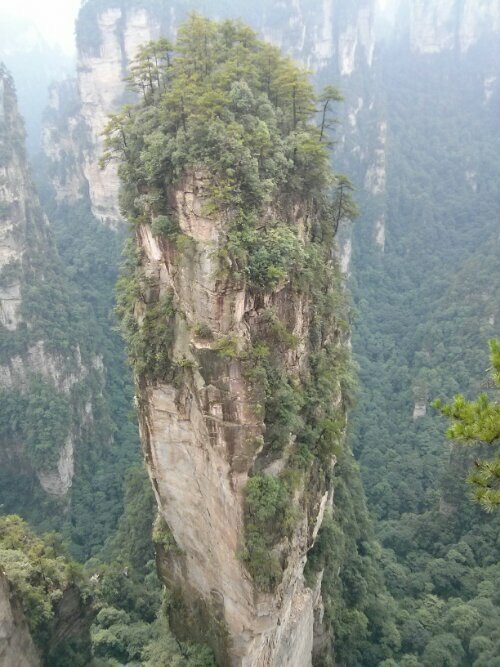 The Bailing elevator in Zhangjiajie National Forest Park (Hunan Province, China) is, at the time of writing, the world’s fastest and largest outdoor elevator. To get to it you enter a massive bus station and queue to ride on one of dozens of buses that shuttle you further up the mountain. You then queue again, this time for hours, snaking your way up flights of stairs ever closer to the elevator. Queuing patiently is not an option: left and right or you people smile and laugh as they climb over barriers to cut out large sections of the queue, smokers barge past with sharp elbows leaving a cloud of cheap cigarette smoke in their wake. Unless you’re a fan of elevator engineering, I would give this one a miss if the queue is long as the ride only lasts 2 minutes and the view on the way up is only as good as the view from the top. I’m impressed by the architectural and engineering aspect of what I have seen over the last few days, but can’t help feeling saddened at the fact that beautiful mountains have had thousands of tons of cement dropped on them to create huge platforms, staircases, restaurants and shops for China’s domestic and international tourism market. 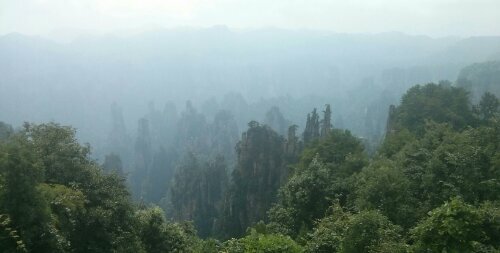 My day improved once I was on Tianzishan (Tianzi Mountain). The views were impressive and I had a chance to take it all in without being jostled forward. Even though it was still busy with tourists, I took the opportunity to take the (paved) path all the way down the mountain as it was quieter than further up the mountain. I had been accurately informed that most tourists on the mountain would opt for taking a mechanical mode of transport off the mountain rather than walk down, and this proved to be true. It also gave me plenty of time to take in the scenery. 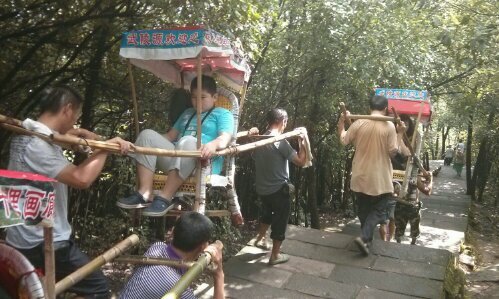 The path down Tianzishan can be managed by anyone with a moderate level of fitness in a couple of hours provided the weather is not too hot/cold/wet, though I did see rickshaw porters rushing to capitalise on tired walkers. I would love to for more of the National Park is opened up to tourists who want to step foot off the beaten track. There are ethnic minorities who still live in the beautiful mountains within the Park and it would be great to get a chance to wander farther in the National Park, perhaps even spending a few days in it at a time. NB: These posts and pictures are being published using a smartphone. It’s very time-consuming, especially typing and photo editing, so bear with me and I’ll publish more photos upon my return to a laptop.